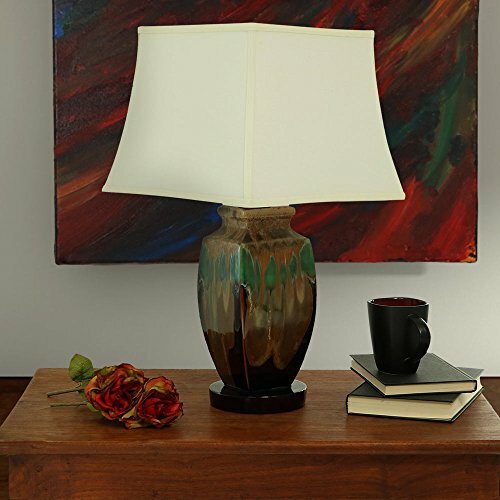 Brighten your living space with this sophisticated 23 Inch accent table lamp. This lamp features a glossy glazed multi-colored ceramic construction as well as a curvy square shaped lamp shade. A glass top protects the light bulb and other electrical components from dirt and debris. Because of the 6-foot electrical cord with the three-prong plug, the weather-resistant fabric lamp shade, and the protective glass top, this lamp may be transitioned and used on your patio or porch area. The lamp operates using 1 type A 100-watt or smaller bulb (not included) so it is sure to illuminate your space efficiently. Additionally, it is turned on or off using the push-button switch on the lamp. Overall dimensions: 13 inch square x 23 inches tall; base: 6 inch diameter; fabric shade is 13 x 13 inches; weighs 8.4 pounds so it is the perfect size to cast a glow on your favorite reading area. Tabletop lamp features a sleek glazed ceramic construction, weather-resistant terylene and cotton lamp shade, and a push-button on/off switch for easy operation. Includes 1 table lamp with a 6-foot 3-prong electrical cord, protective glass top, and 1 terylene and cotton lamp shade, so all you need to do is add 1 Type A 100-watt or smaller bulb (NOT INCLUDED) and plug it in to operate. The glass top gets very warm, do not touch it until it has fully cooled. It is best to clean the lamp shade with a soft cloth or sponge and water without any detergent.